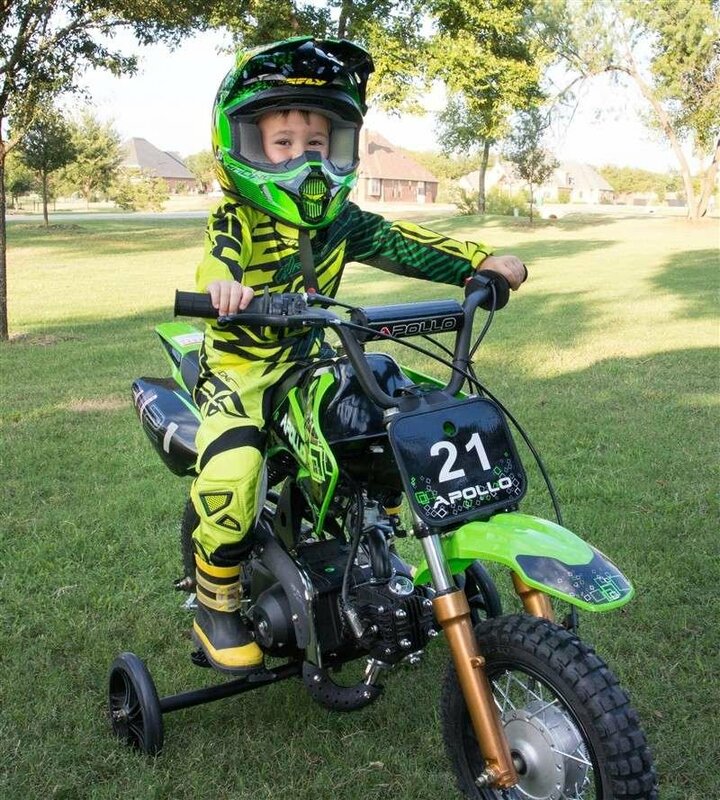 If you’re looking for a flawless kids bike, look no further. Because the Apollo 70 has the perfect size and the perfect amount of power for a wide range of youth riders. The 70cc engine, upgraded suspension and smooth-shifting semi-automatic transmission help build confidence and skill on the trail. While the low weight and seat height make it both easy to handle and fun to ride. And then there’s the legendary Apollo/Orion reliability — the Apollo 70cc is virtually trouble—free, so your outdoor adventures go uninterrupted. Perfect size. Perfect performance. Perfect bike. The Apollo 70cc. Also now available with Training wheel models and fully automatic transmission with electric start models for that new rider to learn safely. SEMI-AUTOMATIC TRANSMISSION- Developed by Orion, the semi-automatic clutchless transmission provides easily manageable acceleration and makes riding the motorcycle easy. HANDLEBAR - Made of high-quality aluminum alloy, the handlebar ensures top stability and safety. A Soft pad on the handlebar brace protects the rider from rough contact. GRAPHICS - The cool graphic design makes the Apollo 70cc look even cooler. Its frame is super-rugged Powder Coated for long life and great looks. 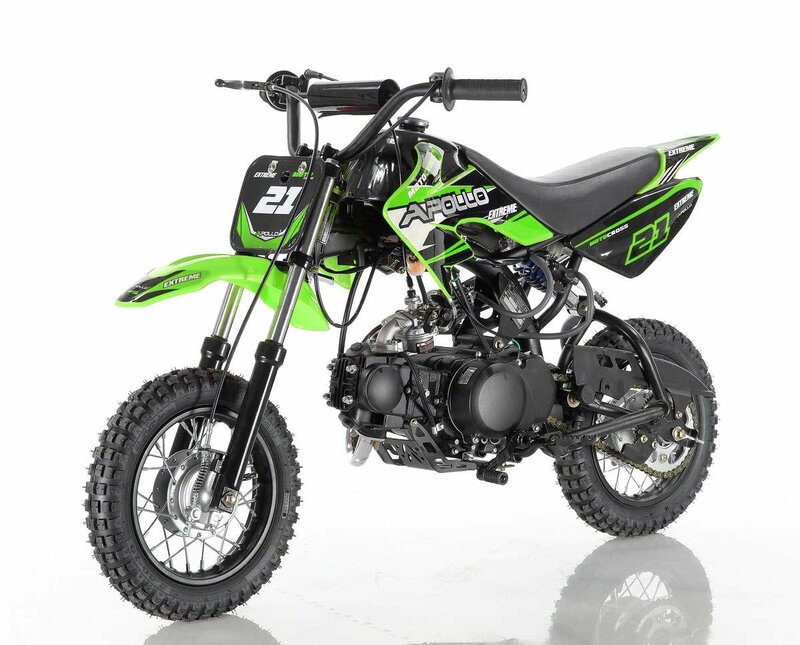 SUSPENSION - Both the rear shock absorber and the upside down front fork Suspension provide ultimate damping and responsiveness. Thanks to optimized tuning, the fork excels with higher reserves against bottoming out. BRAKES - Front and rear brakes by Apollo ensure the best stopping power. WHEELS - Like the Full size Orion Bikes, the 70cc has super lightweight, aluminum rims and the OEM knobby tires provide great traction on any surface. Green, Red, Black, Blue, Yellow.